Just think, it's finally spring. The weather is warming up, You are spending more time outdoors. Your clothes are changing. But, are you remembering to put a coat of sunscreen on your arms because you had that basal cell carcinoma removed from your arm last winter? Yes, you are. Because you want to make sure that no more come back and that you are trying to prevent future skin cancers. Definitely no more tanning, you are only 29 after all. It is the truth. The sun not only causes cancer from burning but it ages us too and it causes skin tanning that leads to skin cancer. So the answer it not to tan. Ever. It's so not worth it. Banana Boat makes the Dry Balance Lotion in a SPF 30 and a SPF 50, both Broad Spectrum. The SPF 30 has Avobenzone 2.2%, Homosalate 7.0%, Octocrylene 4.2%. The SPF 50 has Avobenzone 3.0%, Homosalate 9%, Octisalate 4.0% and Octocrylene 5.0%. 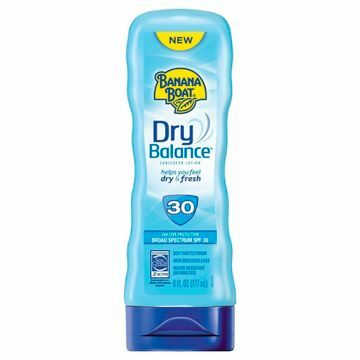 What is so different about Dry Balance? According to the Skin Cancer Foundation, 1 oz. (the size of a golf ball) of sunscreen should be applied daily, 30 minutes before heading outside, and reapplied every two hours or immediately after swimming, sweating or toweling off, but many beach and park-goers alike are deterred by the sticky, weighted feeling of their sunscreens. But they will love this. It doesn't feel greasy or sticky on the skin. It's a lightweight lotion. This is combining the UVA/UVB sunscreen, with the new moisture wicking system. It then wicks excess moisture away from the skin. The sunscreen leaves a soft matte finish on the skin, that makes it feel cool in the sun, not too hot and definitely dryer than before. Skin feels fresh, dry and comfortable. It is also water resistant to 80 minutes. 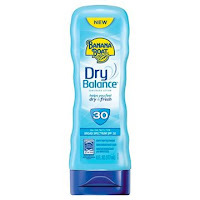 Banana Boat Dry Balance Sunscreen keeps you protected from the sun all while feeling dry and fresh so you can enjoy your big day, no matter where you are and what you are doing! Apply the lotion on your skin and make sure to rub in well. Once applied it is not greasy or sticky. The lotion dries matte. There’s nothing better than a warm and sunny day spent outside with family and friends, but proper sunscreen application is essential to the equation! According to the Skin Cancer Foundation, 1 oz. (the size of a golf ball) of sunscreen should be applied daily, 30 minutes before heading outside, and reapplied every two hours or immediately after swimming, sweating or toweling off – but many beach and park-goers alike are deterred by the sticky, weighted feeling of their sunscreens. 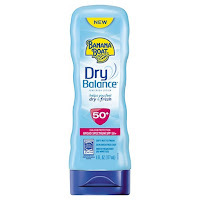 That’s why Banana Boat® is excited to introduce NEW Banana Boat Dry Balance Sunscreen, formulated to draw away excess moisture, and dry with a soft matte finish, so nice that you’ll want to reapply! 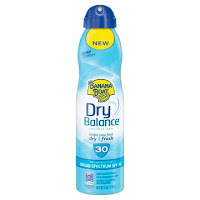 Designed for ideal skin feel, Banana Boat Dry Balance Sunscreen keeps you protected from the sun while feeling dry and fresh so you can enjoy your day, no matter where you are! 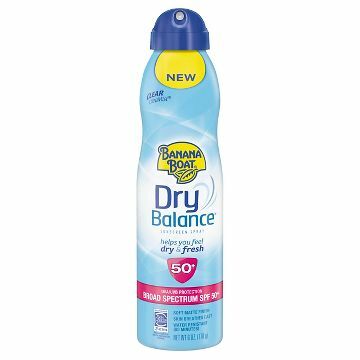 The SPF 50 DrySpray contains Avobenzone 3.0%, Homosalate 10.0% Octisalate 5.0%, Octocrylene 3.0% and Oxybenzone 4.0%. 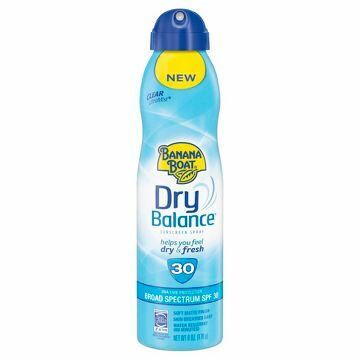 The SPF 30 DrySpray Broad Spectrum contains Avobenzone 2.0%, Homosalate 7.0%, Ocotocrylene 1.5% and Oxybenzone 3.0%. These are chemical sunscreens, not mineral ones. 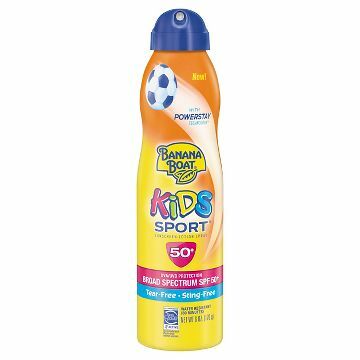 If you are looking for a mineral one, look at the KIDS Sport SPF 50 Lotion. It is very good and contains titanium dioxide and zinc oxide. Spraying the DrySpray is easy. As long as it is sprayed far enough from the skin, it won't make too much in one area. Spray too far and you won't get enough on the area. I say about 10 inches is good enough. 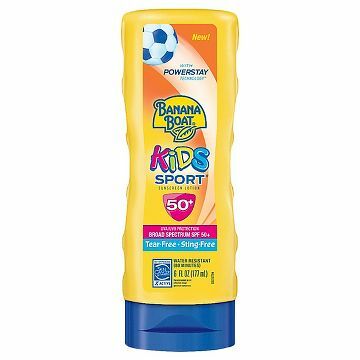 Banana Boat make sun screen that will save your life, prevent future aging of your skin so that you do not end up having lines and wrinkles, skin cancer or the leathery skin that comes with excessive tanning, but they make sunscreen for kids too. 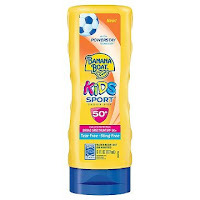 This is the answer to what is a great protective sunscreen for my/your child. 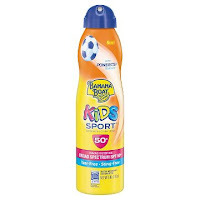 It contains SPF 50 in the form of mineral titanium dioxide 4.25% and zinc oxide 6.5% in the KIDS Sport SPF 50 Lotion. This is a great mineral sunscreen for those who are allergic to chemical sunscreens!!!! The DrySpray contains Avovenzone 3.0%, Homosalate 10% and Ocitsalate 6%. 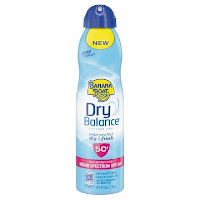 It is good for those who can handle the chemical sunscreen well and need a dry spray for sports, swimming, etc. Both of these sprays are tear-free and sting-free. Make sure to apply liberally 15 minutes prior to going out to your activity and to reapply every 2 hours. Avoid sun between 10-2 because that is when rays are the worst. When it is applied it is easy to apply and the lotion sinks into the skin, it takes a little bit of rubbing but it gets there. The DrySpray sprays easily and dries fast. Just don't spray too far or too close. Then you spray either not enough or too much in one area. Get it? About 10 inches away is good.